SAS started on a much smaller scale in the early ‘70s, when a pair of North Carolina State University faculty members spearheaded a groundbreaking computerized statistics program intended to analyze vast amounts of agricultural data. Soon, SAS software was being licensed by pharmaceutical, insurance and academic entities, and the company was spun off as an independent operation. Doing it all in the Bing Ads desktop tool has been a lifesaver. Phillips refers to himself as “very junior,” having joined SAS in 2015. Following B2C and B2B stints in the hospitality, automotive and event management industries, he took the job after relocating to North Carolina to support his wife’s higher education. Phillips takes pride in the confidence and intent that drive his actions. As with any game, however, there is always the danger of making a false move. That’s why he places such importance on the ability to rapidly dissect the impact of his actions on the paid search chess board. “It’s fun to craft messages and see if I can outdo myself last month, last quarter — even, to a lesser extent, outdo my predecessor's work. I want to try to be better, right?” he says. With Bing, that cost per conversion is a lot lower than other search engines. Whether that's the algorithm, whether that's the lack of competition, I'm not sure, but we love it. Achieving more with less, Phillips is convinced that no matter what games the future may hold, the tools are there to remain one move ahead of the competition — if you’re smart enough to properly wield them. 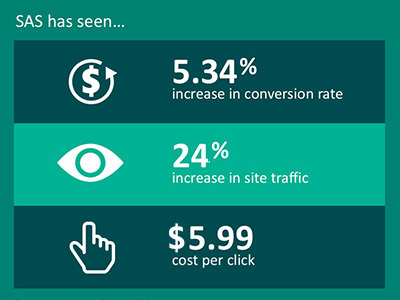 With Bing Ads, SAS increased site traffic by 24% while decreasing the cost per lead by 50%.